No mistaken I love a chocolate cookie. I’d been dreaming about this rye number for quite awhile and needed the excuse of meeting friends (Adam + Ryan and Christine) for a picnic on the beach in Santa Monica. I only name-dropped because I’m going to bring them up again shortly. Hang tight. I was hesitant at first to even post this recipe because I used three flours. Which can be highly annoying. But each one has a crucial purpose and we all decided it was so good that I had to post and keep faith that you all will get the flours and make these too. 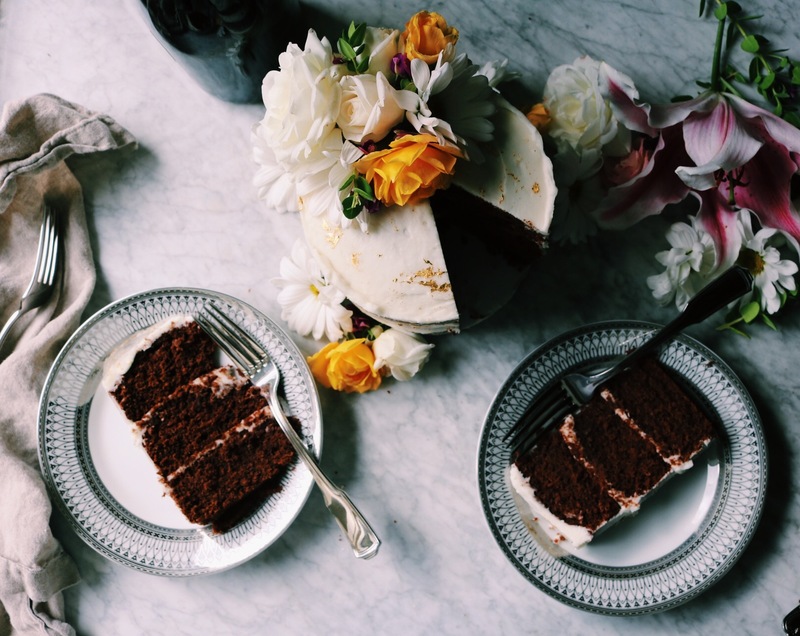 We’re using dark rye flour for an earthiness that pairs beautifully with chocolate (and red wine). I love this combo. Then we reach for bread flour for chewiness and girth. Lastly, we throw in some all-purpose flour for balance and so the cookie doesn’t get too dense. The taste + texture in these chocolate rye cherry cookies is beyond…I can’t wait for you to try them. Our summer so far has been filled with lots of naps, homemade kombucha (this week it’s cherry flavored), a growing garden and broody chickens. I put up a hammock the other day and haven’t wanted to get out since. Gavin likes it too. The other day I cut work early on a Friday and went to Los Olivos with friends and had a hefty amount of rosé and then swiftly moved onto vodka before the sun set. I don’t recommend. But it’s summer, right? My busy season is late August through January, sometimes February. That’s when I have the most work and can’t seem to get recipes created fast enough. A kitchen is cozy in fall/winter and just plain hot any other time. So I’ve been making plans to make the most of cooking (and eating) season. I’m working on a retreat with Adam, Ryan + Christine…we want something that focuses on food. As in, cooking classes and styling + entertaining workshops to get everyone ready for the holiday season. We’d like it to take place in the Santa Ynez Valley and fill it with wine tasting and farm-to-table dining all while taking advantage of fall produce and all the pretty leaves falling from the trees. We’re going to limit the attendees, so if you’re interested please email me and I’ll put you at the top of the list. The other thing I’m thinking about doing is opening the Displaced Kitchen (aka my home) to less than a half dozen people for some baking classes… This one is still in the early stages…but if you live in Santa Barbara County and are interested, also email me about this. I’d like something along the lines of us baking something together (brunch, scones, muffins, cakes, pies, pizzas, pasta) and then sitting down for a meal together. It also wouldn’t be a proper meal without some wine or cocktail pairings and treats to take home. Since the Displaced Kitchen is also ground zero for my #HotAsBalls summer baking series…this one may need to wait until fall to commence once my kitchen has cooled. Stay tuned. Flour. If you futz around with the flours, omit one, use more of another or substitute another flour completely, it will change the outcome of the cookie. If you use the rye flour + all-purpose flour for the remaining flour, your cookie will be flatter and have less chew. Conversely, if you were to use all bread flour instead of all-purpose you’ll end up with a thicker, denser cookie. Arm yourself with knowledge so you know what you’ll be getting. Unsweetened Cocoa Powder. I’m a huge fan of special dark cocoa, but you can substitute regular unsweetened cocoa for the recipe. I use both Hershey’s and King Arthur Flour’s unsweetened cocoa powders. Chilling Your Dough. Chill your cookie dough before rolling into balls…it will make it easier to handle. You’ll be shocked what 30 minutes in the fridge does. Shaping Your Chocolate Cherry Cookies. I don’t use cookie scoops. I don’t like them for whatever reason. I gently roll the balls into little spheres. The rounder the sphere, the more perfectly round the cookie. Let’s bake some chocolate rye cherry cookies, shall we? Melt the 8-ounces of chocolate + oil in the microwave (in 30 second increments on High, but microwaves are funky so keep an eye on things) in a large microwave-safe bowl or in a double boiler. Stir the chocolate to get rid of any chunks. Sometimes it will look chunky, but if you give it 20 or so stirs with a wooden spoon, you’ll get rid of all of the chunks without overheating (burning) it. Let cool slightly and then whisk in your eggs, brown + granulated sugars and vanilla extract. In another bowl whisk together the rye flour, bread flour, all-purpose flour, cocoa powder, sea salt, baking powder and baking soda. Pour the flour mixture into the chocolate mixture and give a couple of stirs until the dough is just starting to come together. Add the cherries and mix until just barely combined. Lay some plastic wrap on the counter, dump the dough on top and wrap tightly. Chill the cookie dough for 20-30 minutes in the fridge. 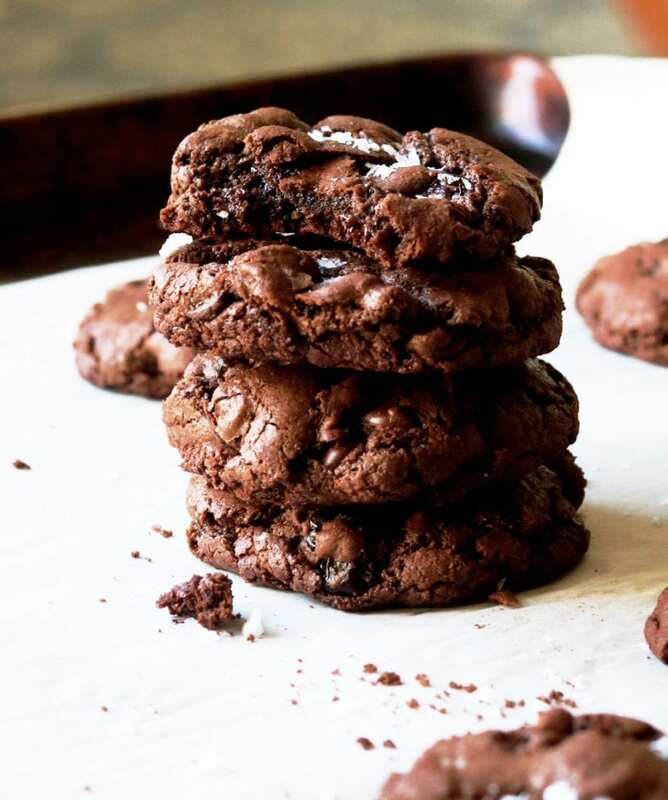 Preheat your oven to 375 degrees F, place a rack in the top third of your oven (this is where you’ll bake your chocolate cherry cookies) and line your baking sheets with parchment paper or a silpat. Gently roll 1 tablespoon of dough into a ball and place on the cookie sheet allowing about two inches between each dough ball. Bake for 9 minutes. You want to slightly under bake these. 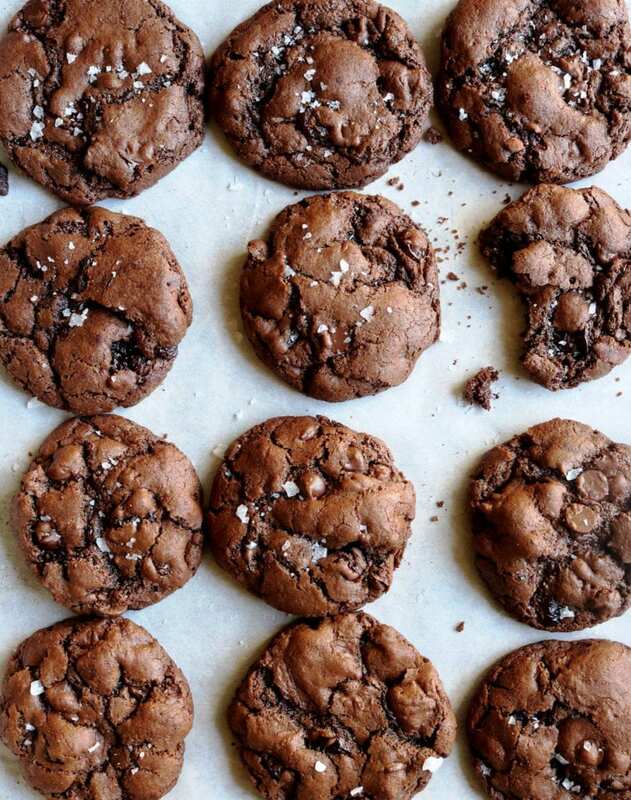 Once out of the oven sprinkle with the sea salt flakes (if using) and allow the chocolate cherry cookies to cool on the sheet for 5 minutes then transfer to a cooling rack. Thank you for making these chocolate rye cherry cookies! 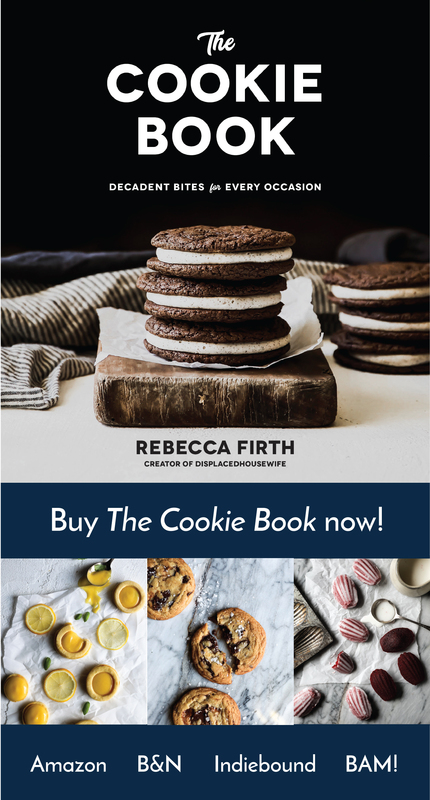 Tag me on social @displacedhousewife #displacedhousewife so I can see your gorgeous cookies!!! An interesting little read on power. I’m obsessed with House of Cards…which makes me light years behind the rest of the world. Have you watched it? I’ve realized the only way I can get motivated to exercise is if I have something interesting to watch or listen to while doing it…any new suggestions? Wishing you all a wonderful holiday! Sending lots of love + light. Loved your cookies!! A huge hit with the family. 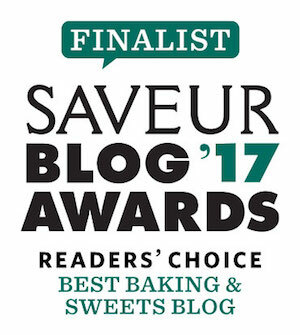 Thanks so much… made use of my left over rye and bread flours. SO much in this post, Rebecca. First, bring on the three flours! Delicious and delightful combination of flavors and textures. I’d love to know your source recipe for kombucha ! I enjoy it so much but haven’t made my own. Your workshop sounds incredible – I appreciate the farm to table focus. So much fun! I’ve vowed no workshops this year due to last year’s travels… maybe next year? House of Cards. OMG. We marithoned it then the end came. OMG we couldn’t wait for the new season to arrive. We watched it in a week… now there’s nothing to watch! LOL! We’re waiting for the next season. We’re certain their’ll be one! Love your combination of ingredients ! Will do, definitely ! Thank you and have a nice weekend ! These cookies sounds fantastic Rebecca! I love the addition of the rye flour. And the chocolate cherry combo is always a winner. I totally enjoy the hammock too. Perfect place to relax and catch a nice little summer nap! Hope you have a fabulous 4th! 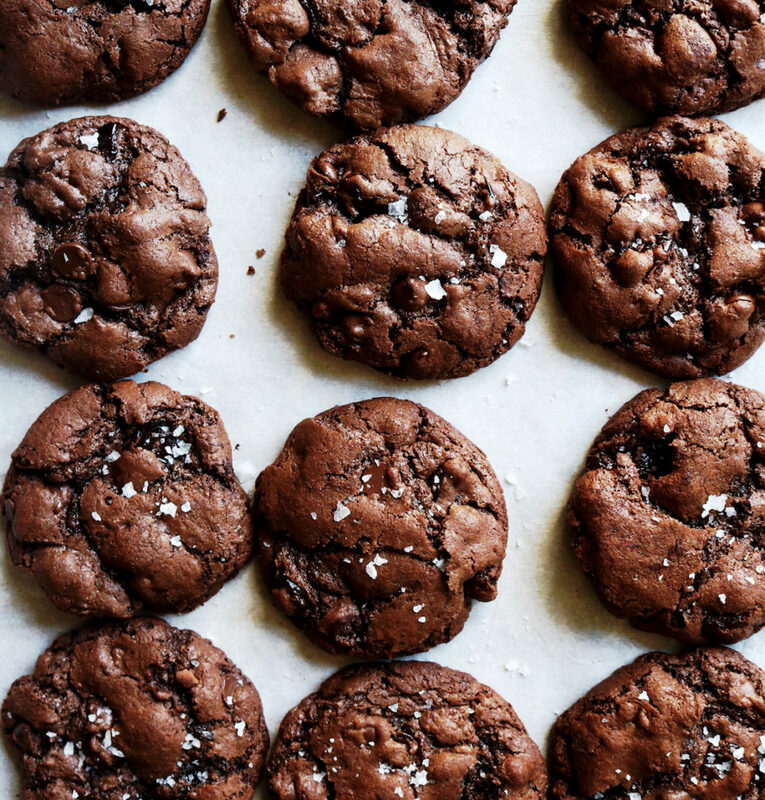 We can personally attest that these cookies are BEYOND. So rich and fudgy, perfect texture, and the cherry/chocolate combo is to die for! You are unstoppable! These cookies look great!! I can’t wait to try them!